I’m sure it’s obvious, from all my recent posts, that I had an amazing two weeks in Guatemala. I had such a wonderful time that I didn’t want to leave. 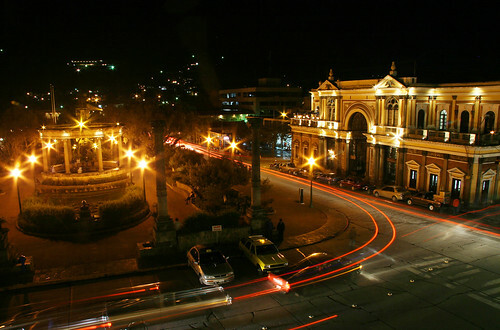 I just wanted to settle in and stay in Xela for another month or two. If you’re interested in taking a Spanish-learning trip, I couldn’t recommend PLQE more. I learned more Spanish in two weeks there than in my whole life, combined. Sure, I still have a long way to go to achieve proficiency. But before I went, I only knew the present tense and the basic future (ir + a + infinitive). Now, I’ve learned the pretirite and the imperfect, and can actually talk like a real person (well, like a total Spanish newbie)—but at least I don’t have to talk about the past using the present tense! I’ve also found that I can understand much more now than three weeks ago. And this is going to sound so cheesy, too—cue the sappy music—but the whole time I was at PLQE, I was really inspired by everyone around me: My teachers, who taught me a ton and shared stories about their own hardships. 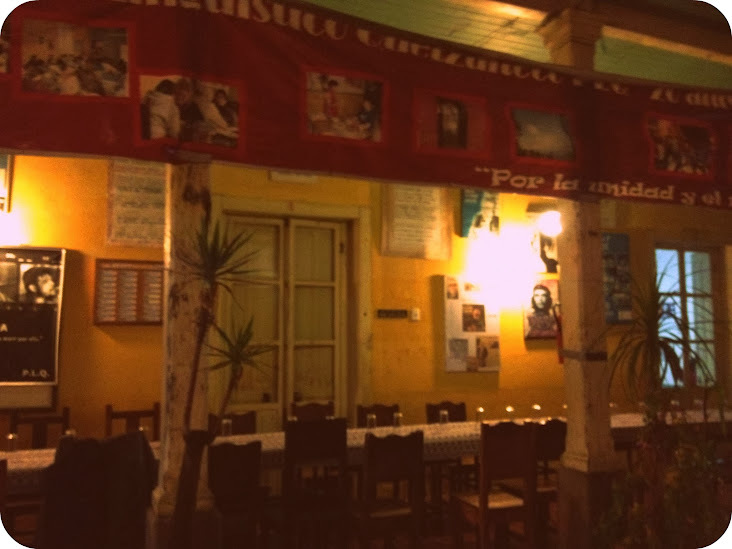 MyВ host family in Xela, who were so warm and welcoming that I felt at home there, even though it was just for one week. My host family at the Mountain School, who always gave me lots to eat, even though they didn’t have much, themselves. And my fellow students. Like me, most were in their late 20s to late 30s and at transitional points in their lives, between degree programs or careers or relationships (or some combination of those). Each person had an interesting story of why he or she was there. But unlike me, most were staying longer—which I was very envious of! When I first came to PLQE, I was dreading the graduation ceremony where I’d have to present—in Spanish—something to demonstrate my newfound language prowess. And though I was super-nervous, my presentation went well. I made a list, entitledВ “10 Maneras Para Saber Si Tu Eres Un Estudiante de PLQE”В (“10 Ways to Know If You’re a PLQE Student”) and comprised of inside jokes about the school. Thankfully, people laughed. Everyone else’s presentations impressed me—their talents were so diverse! One woman salsa danced (really well, I might add), one guy freestyled in Spanish and English, another performed a dramatic monologue. Others told jokes, read poems or played the guitar. Admittedly, I spend so much time in my ballet/writing world, that I’m always awed and very appreciative when I see other peoples’ passions on display—especially when they’re in a language they just learned! I’m not a spontaneous person, but I booked this trip on a whim. I didn’t research any other schools and only did a quick Google search on Xela to make sure the city hadn’t been hit by some natural disaster before buying my ticket. I couldn’t be happier with how it turned out. It was really one of the most rewarding trips I’ve ever taken. 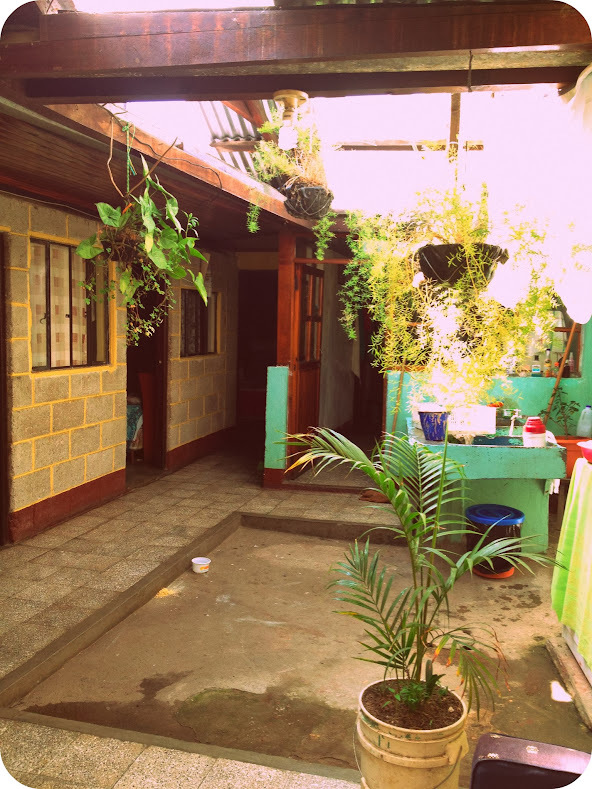 For the week I was in Xela, I lived with a Guatemalan family. 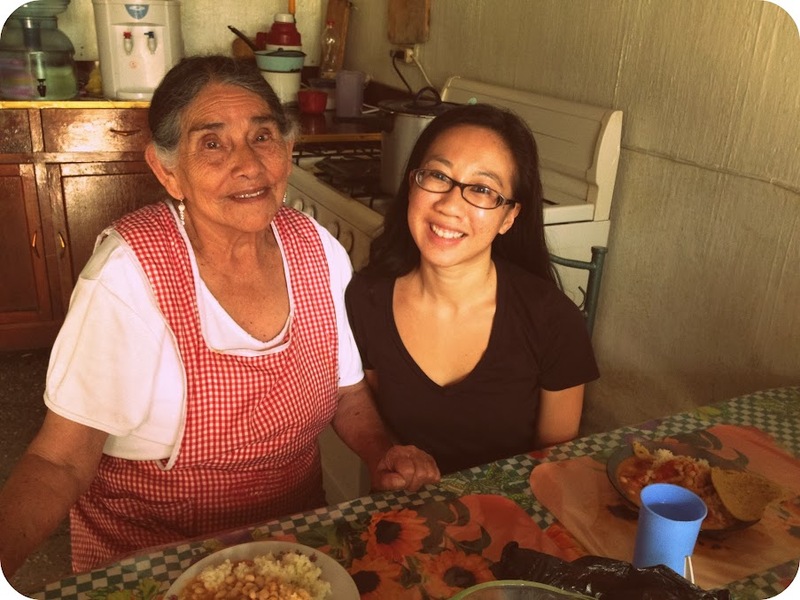 My host mom was more like a host abuela—Catalina was an older woman who had several adult children and grandkids, most of whom lived nearby. She’d been hosting PLQE students for more than 15 years. Her house was on Diagonal 2, a few blocks away from PLQE. 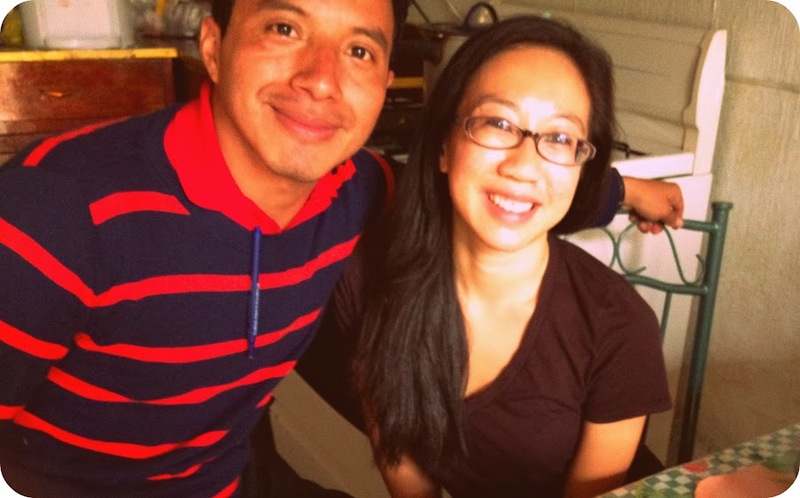 Besides her and myself, two 20-something Guatemalan guys lived there: Eddie, who worked in a bank, and Gaspar, a med student. I loved the layout of Catalina’s house and wished my NYC apartment resembled it more. Four bedrooms, a bathroom and kitchen flanked a small, central courtyard that was bright and airy during the day, when the sun streamed in. The focal point of the courtyard was the pila, the green, table-like structure on the right. It has a basin in the center for clean water, and two surfaces on either side for washing dishes and clothing. My room was small and basic, but comfy enough. I came home for every meal and felt super-lucky to have Catalina as a host mom. She was an amazing cook and never served the same dish twice. Breakfast was usually eggs (my fave! 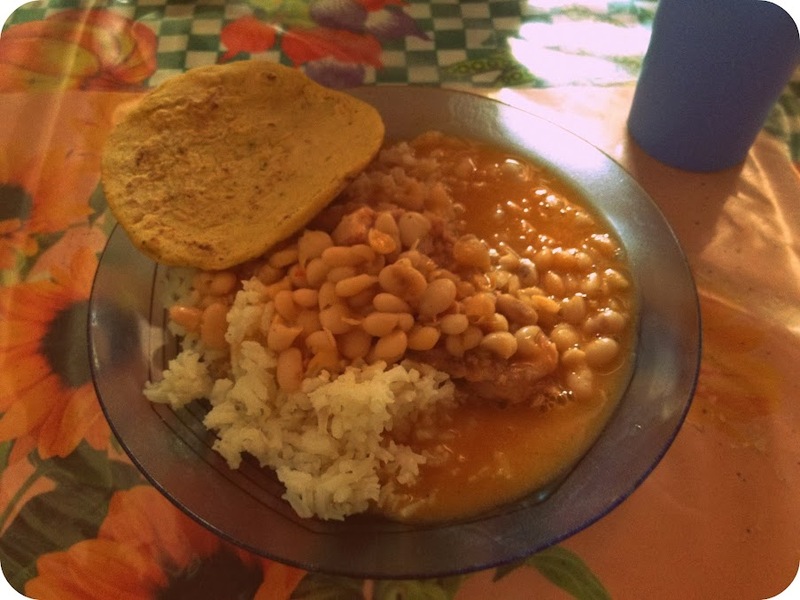 ), beans and the amazingly delicious corn tortillas that Guatemalans eat with every meal. Lunches and dinner were often rice, chicken or pork with veggies and more tortillas. Catalina’s dishes were such a nice change from the oatmeal/eggs/avocado/bagel/soup diet I subsist on at home in NYC. 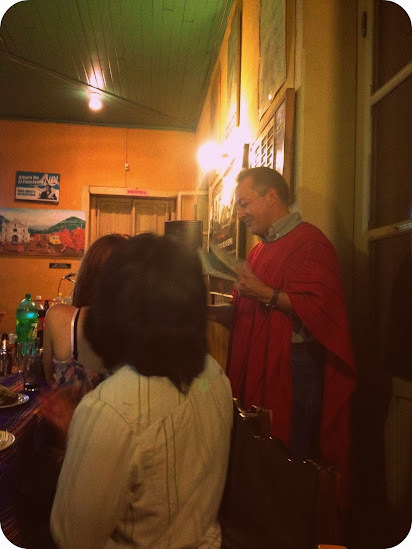 Plus, those meals were another opportunity to practice Spanish—though, admittedly, I couldn’t really follow the conversations unless someone spoke directly to me in slow, basic Spanish. And then repeated everything twice. Gaspar spoke English quite well and (even though I guess it was cheating, a little!) sometimes helped me out by explaining words and phrases in English. 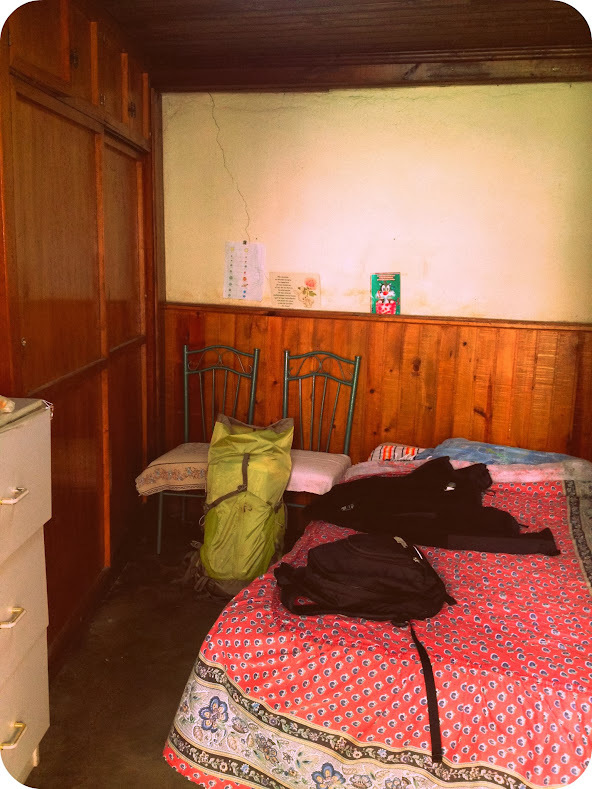 Before I came to Xela, I notified PLQE that I was allergic to cats and dogs and couldn’t live in a house with either. But it didn’t occur to me that families would have other kinds of animals. On the first day I met Catalina, I nearly freaked out when I saw her pet—a plump chicken named Paloma. I am deathly afraid of birds. That afternoon, she started to walk into my room, but ran out when I gasped and jumped on my bed. After that, she stayed away from me (smart bird!) and only tried to come in one other time. I never told Catalina I was afraid of Paloma because I a) didn’t want to be an inconvenience to her or PLQE and b) because I thought I should face my fear and just deal with it. 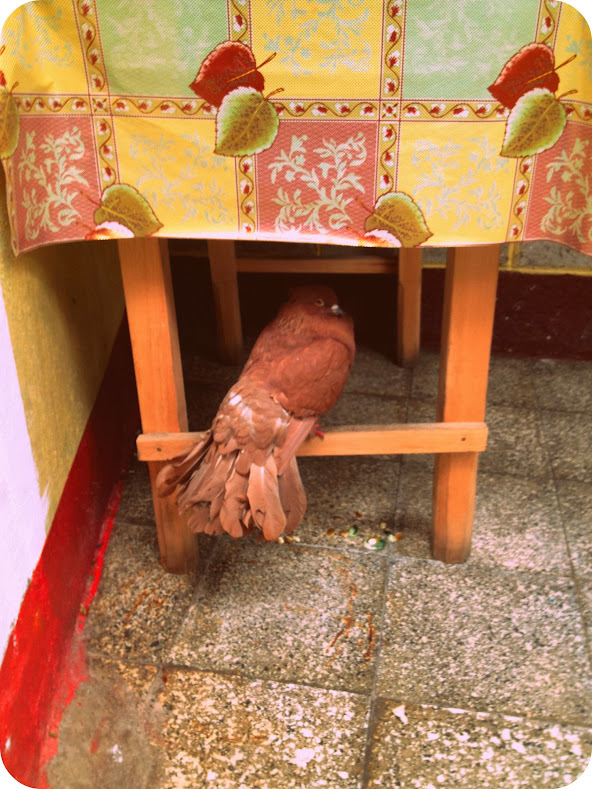 That tactic kind of worked—I got used to living with a bird and, after a few days, stopped cringing when I heard her making bird noises outside my room. Eventually, I didn’t even have a problem eating chicken while Paloma sat in the next room. I suppose that’s part of what this trip was about anyway—learning and self-growth. On my last day in Xela, Catalina gave me a notebook in which all her former students wrote her a note, along with their contact information. It was interesting to see where everyone was from (mostly different cities in the US and Canada) and how good their Spanish was (most seemed way better than me). With only one week of Spanish under my belt, I needed a dictionary to write my letter, but I thanked her for her hospitality, patience with my Spanish and, of course, for her delicious cooking. And I apologized for any errors! I feel like you can’t go to Central America and not do a difficult hike. 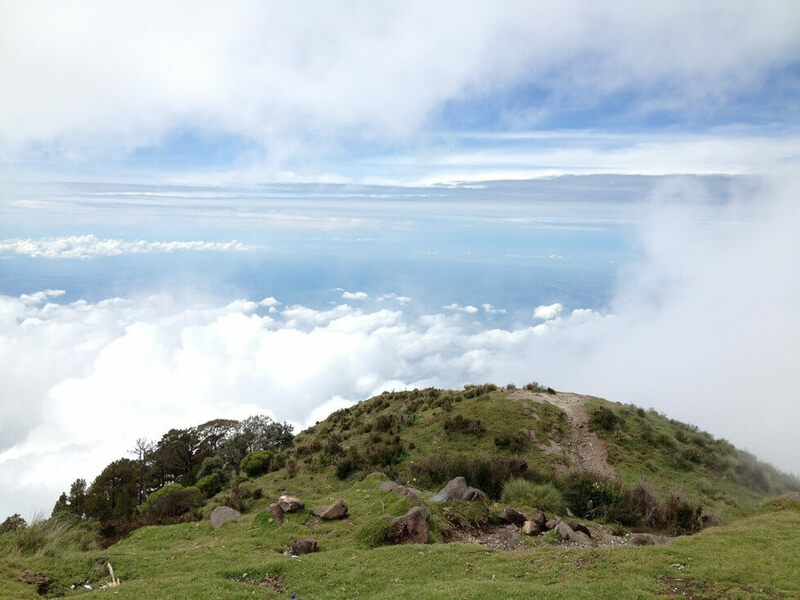 Guatemala, like most countries in the region, has several hikeable volcanoes, and I was excited when I learned that one, Santa Maria, is in Xela. 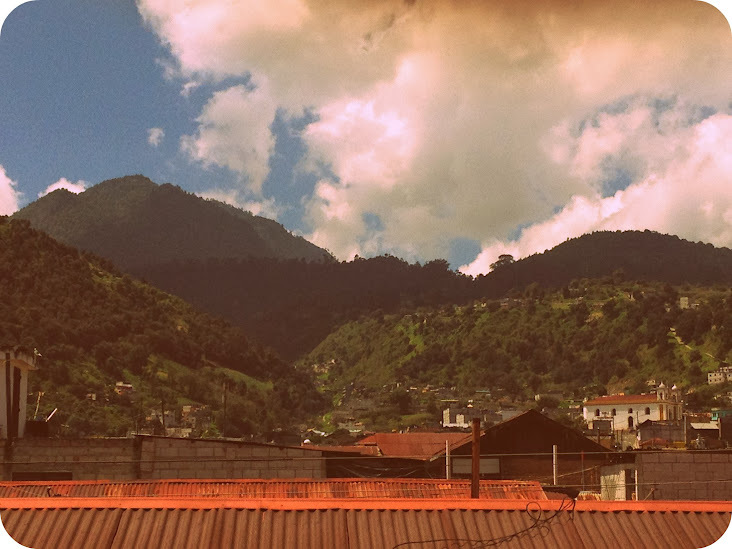 So before I even arrived in Guatemala, I was planning to hike that volcano. I was two beers into the night when, Haider, a PLQE student I invited on the hike, told me that he had just called Monte Verde’s office and signed up, and that the hike was back on. I put down my beer and headed home soon after–I needed to be up only a few hours later, at 4:30 a.m. 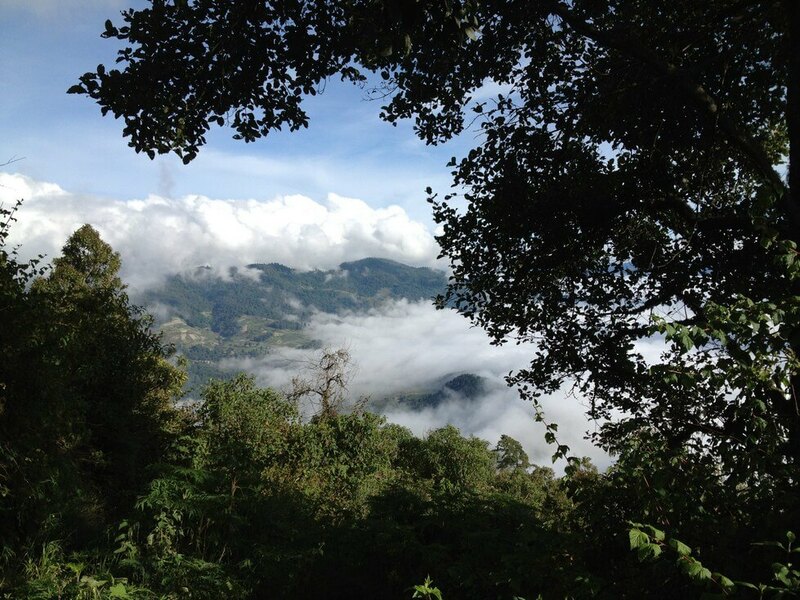 Most people start hiking Santa Maria super-early, since it usually rains in the afternoon. It was downpouring when I fell asleep and I tried not to think about how muddy the trail might be. 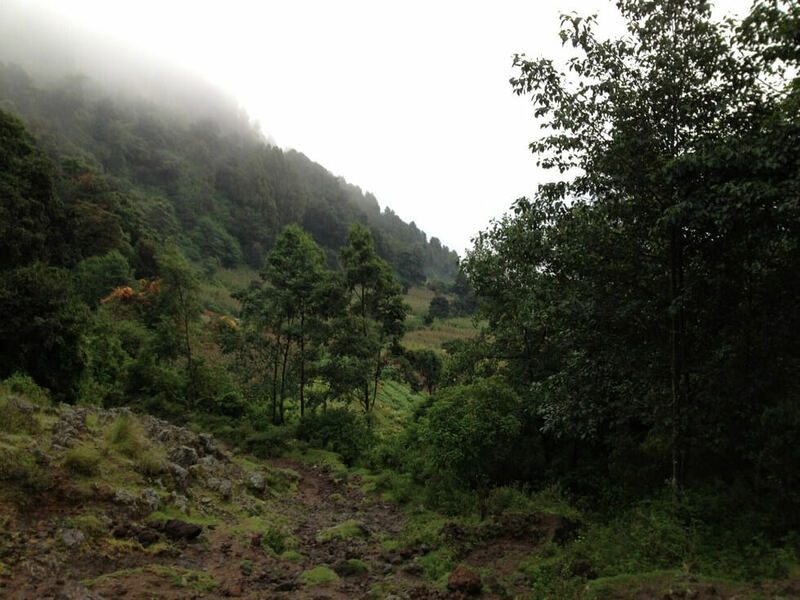 The rain had stopped by the time Monte Verde picked me up at 5 a.m. We rode 30 minutes to the volcano, and commenced our climb just as dawn was breaking. Our guide was Carlos, a 41-year-old local who, thankfully, kept his Spanish simple, but also spoke very good English. Along the way, he waxed philosophical about how lucky we were to have this opportunity to experience nature and how we need to be good to the earth. My favorite Carlos-ism from the trip: At one point, when I was wiping dirt off my hands, Carlos pointed out that it doesn’t matter how dirty we are on the outside, as long as our souls are clean on the inside. Very deep for hiking! The trail was steep and a little muddy, but pretty well-kept. It wasn’t hard to figure out where to go, and rocks provided adequate footing. There was, sadly, a bit of litter strewn about at places. The views along the way were stunning. We stopped frequently to take in the scenery and snap pictures. 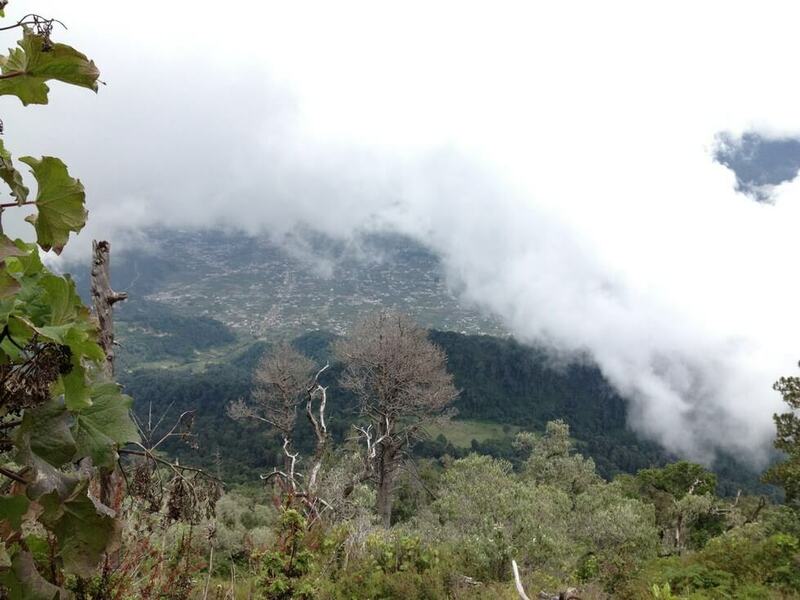 Until the clouds rolled in, after about two hours of hiking, we could see glimpses of Xela below. 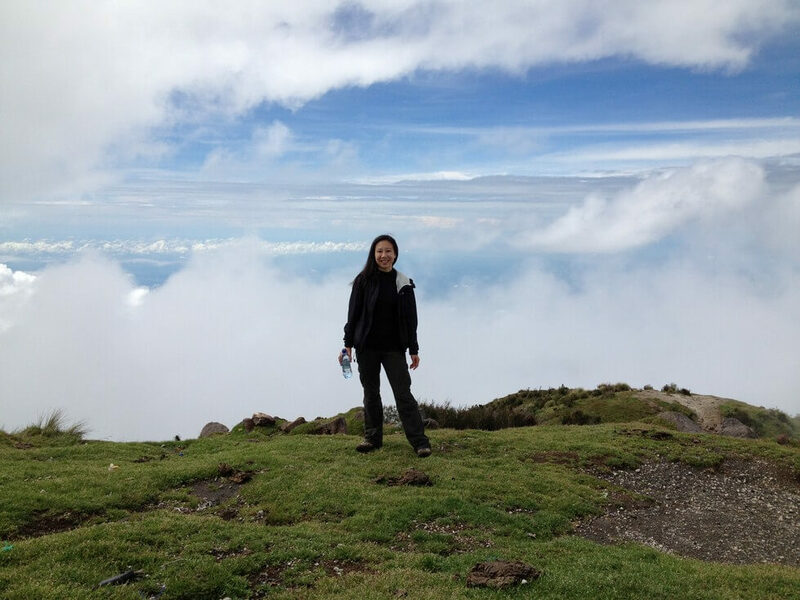 Eventually, we climbed above the clouds, higher than other nearby mountains. As we neared the summit, we ran into small groups of other hikers, including local women who were just wearing sandals on their feet! 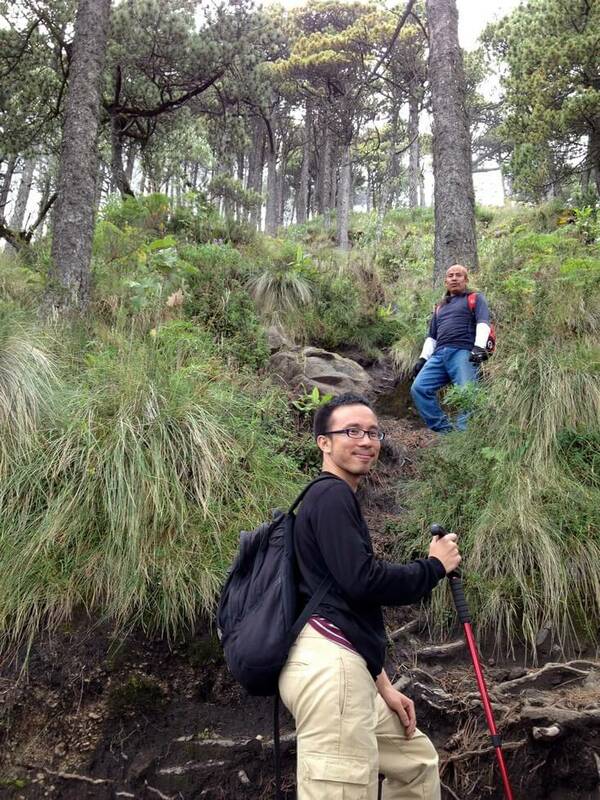 HereвЂ™s a shot of Carlos and Haider approaching the top. I was really excited when it came into sight! We reached the summit after nearly four hours of hiking. Unfortunately, clouds obscured views of the city. But they moved quickly and, at times, we could glimpse the hillside. My favorite spot was here, where you could see the horizon line of the Pacific, in the distance. 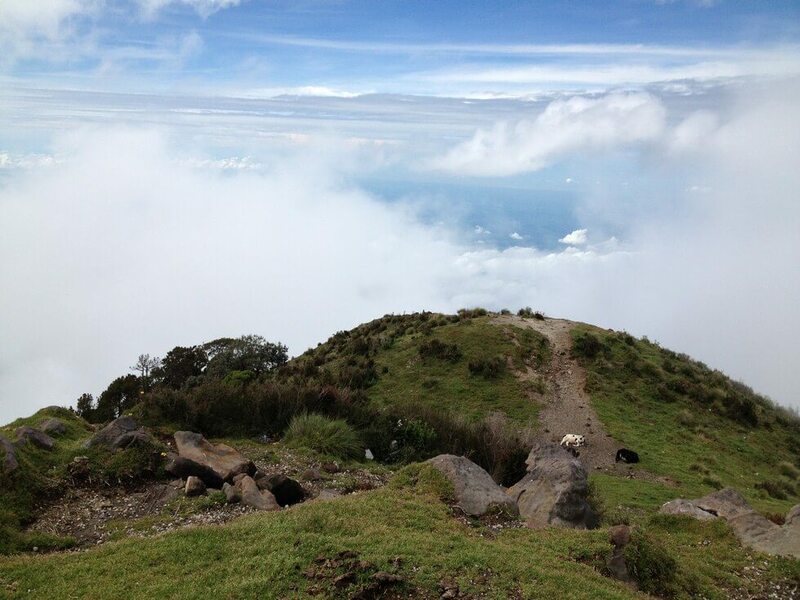 We ate lunch while admiring the view, in the company of wild cows who live at the summit. Then it was time to turn around. The climb down was slow going because it was so slippery. Haider and I had to navigate carefully and, at many times, we were practically skiing as we slid on the mud. In fact, I learned the word Spanish wordВ cuidaВ (careful) from Carlos telling us that so many times. My legs felt fine (all that ballet in August prepped me for this! ), but toward the end, I was physically exhausted from hiking for eight hours, waking up so early, starving from not packing enough food–and just ready to get off the volcano! Still, the hike was really a highlight of my trip. I won’t be forgetting the gorgeous scenery along the way, especially the views from the top. It was, as they say in the Spanish-speaking world, vale la pena–worth the pain. I love the intense Spanish lessons I have every day here at PLQE.В But like I mentioned,В the non-stop learning is tiring. So I was really excited when a group of us took a field trip toВ Las Fuentes Georginas–hot springs in the mountains outside Xela–yesterday afternoon. To get there, we piled into the back of a pick-up truck for the 45 minute ride. It was bumpy and a little nauseating, but also lots of fun. We drove through small towns and wound through farmland filled with vegetable crops. I took the two photos below from the back of the truck. The hot springs were clearly built for tourism and named after former dictator Jorge Ubico’s wife. Despite that, I was thrilled to be out of the city and soaking in the warm waters. Since it was an overcast weekday afternoon, only a few other people were there. The pool on the top level was closest to the source and therefore the hottest. I was shocked at how high the temperature was. None of us could go all the way in. I only managed to get in waist-high for a few minutes! We saw just one crazy guy splashing around in that one–and he told us he took an ice shower beforehand to numb himself against the heat. Um, smart? 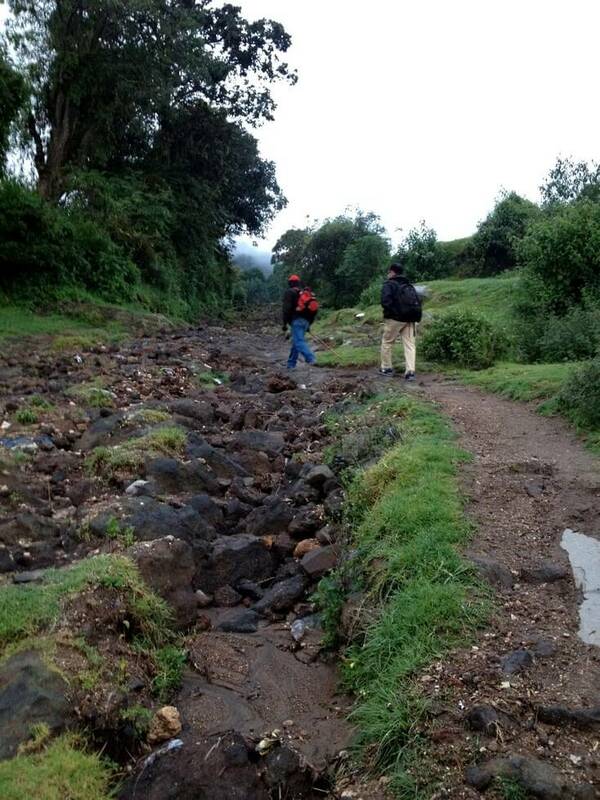 …until we reluctantly had to get out, dry off, hike back up and board another pick-up back to Xela. 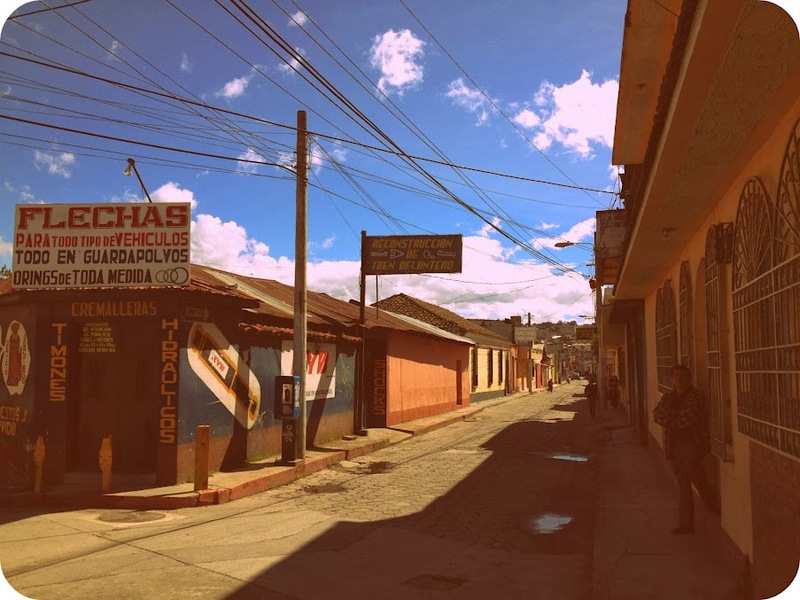 I’m about to depart onВ my end of summer trip–two weeks in Guatemala to learn Spanish! 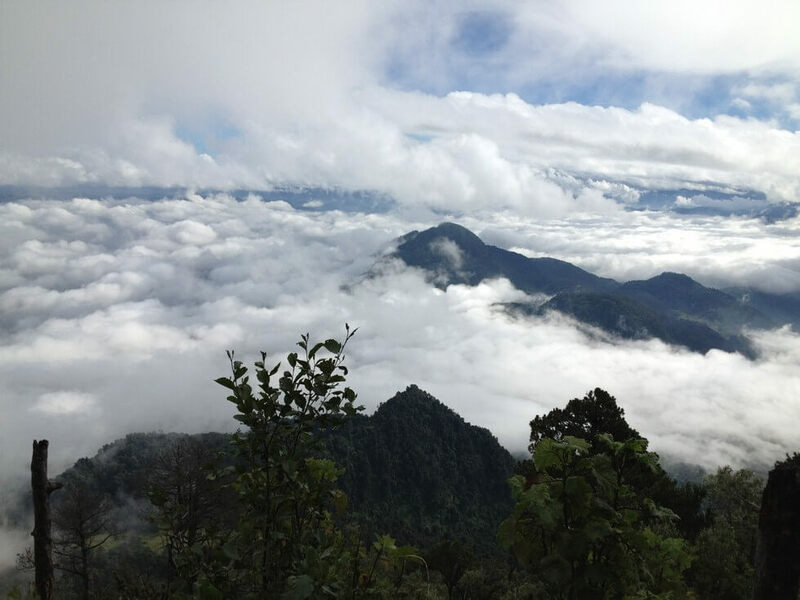 I’ll be studying atВ Proyecto LingГјistico Quetzalteco de EspaГ±ol (PLQE), spending one week in Quetzaltenango, Guatemala’s second largest city, and one week at La Escuela de la Montana, their other location on a coffee farm in the mountains. 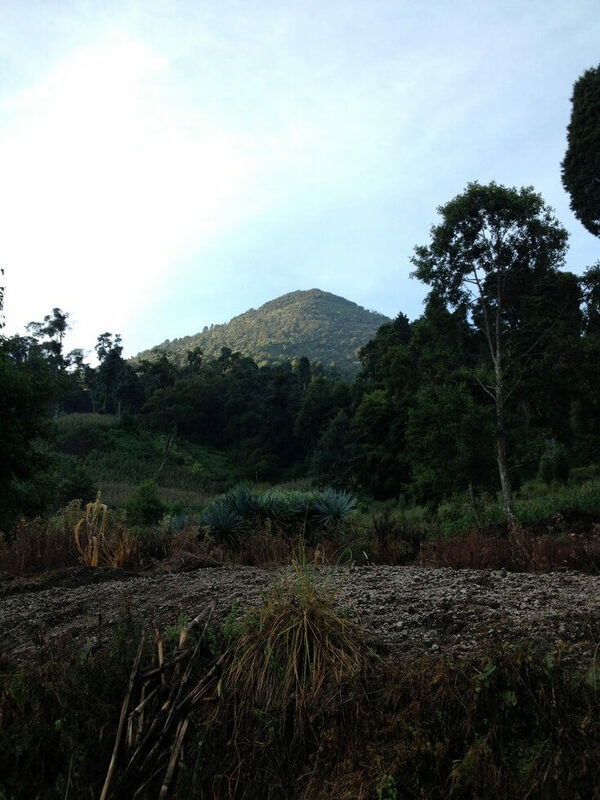 Earlier this month, I felt a little nervous about going–mostly about the mountain school. As a city girl, I’m never quite at ease in rural areas. I feel safe in big urban areas where there are lots of people and noise. When I’m surrounded by nature and the unfamiliar sounds that come with it, I’m always a little on edge. Even suburbs kind of creep me out!